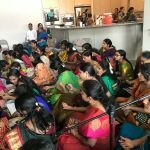 By divine grace, a grand Radha Kalyanam was conducted on Saturday July 7th at the residence of Smt. 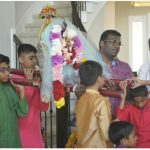 Priya ji and Sri Prasad ji’s residence to celebrate the birthday of their son. 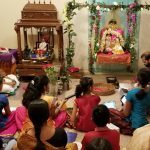 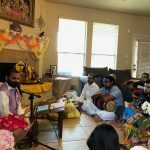 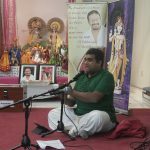 Krishna’s Cottage Bhajans, a youth bhajan group initiated by the blessings of Sri Muralidhara Swamiji, led the satsang with Sampradaya Bhajans. 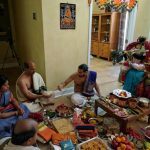 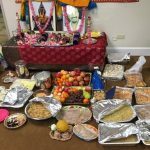 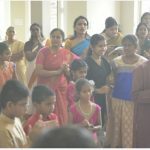 The event was attended by more than 100 people and included a Janavasam procession and concluded with Mangalyadharanam, Jhula seva and a reverberating singing of Sri Swamiji’s Kaliyaiyum Bali Kollum kirtan.